Whether you’re unpacking and repacking decorations or sorting through things to make room for visitors, if you’re like a lot of folks, the holidays see you spending a lot of time in your attic. Now that most of the holiday chaos is over, it’s a great time to think about something you probably haven’t thought of: cleaning out the attic! Check out some tips from Mr. Junk. IMPORTANT SAFETY TIP: When walking in the attic, only step on the floor joints. Never step between them! Make Time. You’ve probably got a lot of stuff up there, and even if you don’t, the attic is a dark and potentially dangerous place to be. Plan to spend a good amount of time up there. Think Safety. Protect yourself! Wear long pants, sturdy shoes, long sleeves, and a mask to protect against dust particles. You’ll want to make sure you have plenty of light, so consider a hands-free option like a headlamp. Also, consider that your attic is probably much colder than your house, and dress appropriately. Divide and Conquer. 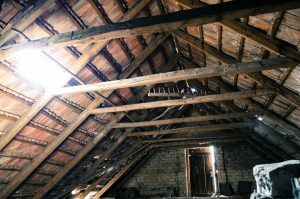 Since there’s so much space, and attics tend to be so inhospitable, divide it up into sections and tackle one at a time. And finally, call Mr. Junk. After you’ve pulled the junk from your attic, do you really want to worry about sorting it before you get rid of it? At Mr. Junk we do the sorting for you! We’ll handle recycling, donating, and garbage, and we even sweep up after ourselves. Contact us for an appointment today!